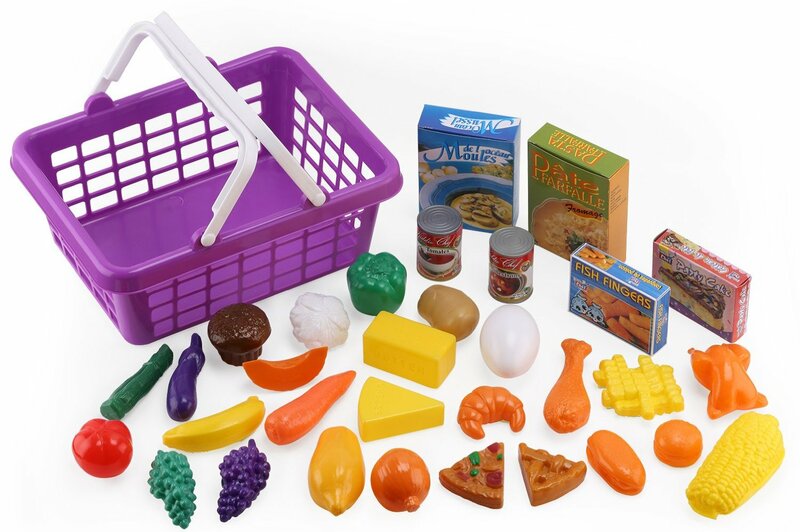 I just got this great basket of pretend food from Homeco. This is a great way to ignite imagination in the kiddos. In this set you get 32 different pieces of food. They give you a huge variety of fruits, veggies, meats, dairy items. You can find corn, cheese, egg, chicken, and much more. They also include a few canned food items and boxes food items. It all comes in a cute little plastic shopping basket. A great way to store it all when not playing with it. I got this for my six year old. She has a little kitchen and grocery store play set as well as a cash register. She will spend hours playing with these play sets. This basket of food is a great addition to the play sets she already has. She can pretend to purchase the food, cook the food, and serve the food. She has a blast pretending to cook and shop. The pieces are made of plastic and very durable and well made. Great set!